A highrise in Parkdale. Photo by peter pelisek in the Torontoist Flickr Pool. Bed bugs. Mice. Badly needed repairs ignored for months, and then, when finally attended to, done shoddily. These are just some of the issues renters in Parkdale say they’re experiencing in buildings owned by MetCap Living Management, a major landlord in the city. After enduring subpar living conditions but being asked to pay more and more rent—MetCap is applying for above-guideline rent increases for many of its buildings—tenants organized and began to take action. 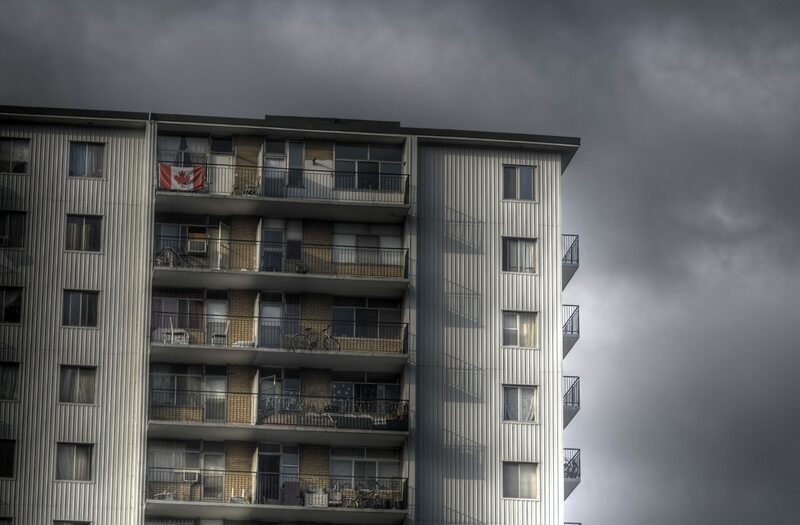 That led to the beginning of a rent strike on May 1, initially involving about 200 tenants in six buildings, according to Cole Webber of Parkdale Community Legal Services. And as of June 1, another 100 tenants at six more buildings are joining in. They’re asking for needed repairs to be made and for the company to withdraw its application for above-guideline rent increases at five buildings. Most of the striking tenants have received eviction notices, Webber said, though it remains to be seen whether MetCap will move ahead with a mass eviction or meet with its tenants and agree to their demands. Bryan Daley, a MetCap tenant and participant in the strike, said that the company seemed to be “operating with a softer hand” since receiving bad publicity and backlash over its attempts to force some tenants to remove banners advertising the strike. Webber explained that some property managers had demanded tenants take down their banners, even trying to push their way into one wheelchair-bound tenant’s apartment. But that softer hand was nowhere to be seen earlier this week, when a group of tenants approached a property manager demanding two elderly tenants receive money for accommodations as work is done in their apartment. “They’re elderly people, they don’t have any family, they can’t afford accommodation,” Webber said, adding the pair wanted enough money to stay in a budget hotel. MetCap CEO Brent Merrill picked up the property manager, Darren Shaw, in his truck after Shaw “ran away” from the tenants, according to Webber. A cellphone video shows the truck driving slowly as a group of people try to keep up with it, and then, with one person, Kevin Laforest, in front of the truck, speeding up to drive away. In the video, Laforest runs backward in front of the truck before falling to the side as the vehicle drives away. Webber said the person who was knocked over was left with scrapes and bruises but nothing more serious. Merrill said Thursday that he’s unable to discuss what happened, except to say that he’s apologized to Laforest and that the apology was accepted. Daley said the incident is one of many that seems to show MetCap and Merrill’s lack of respect for their tenants. Daley joined the rent strike initially because he’s dealt with drafty windows and a bathroom where the ceiling leaked every time the tenant above him used their shower. Both issues were put off, he said, and when they were finally repaired, both were done poorly. The bathroom had to be redone earlier this year. And in spite of those serious issues, he, along with many other MetCap tenants, is facing an above-guideline rent increase. The disparity between what he’s paying for and what he’s receiving is what brought him on board with the rent strike. Merrill takes a different view. “We’re heavily focused on maintenance, we have a very strong maintenance program,” he said, adding that a few weeks ago, the company sent out letters to residents with contact information for anyone needing repairs and work order sheets attached. That effort resulted in just 50 new work orders, and the company is down to 37 open ones, according to Merrill. The frustration of feeling as though he was “paying for a BMW but I’m driving a 1970 Honda Accord,” along with the confidence that came with learning more from PCLS about his rights, led Daley to join the strike. And after he did, he said learning about the issues his neighbours are facing strengthened his resolve. Many of MetCap’s tenants are longtime Parkdale residents. Webber said the company’s approach of justifying a request for a rent increase by renovating a building’s lobby, meanwhile neglecting repairs to specific units, is a “two-pronged approach” to pushing out longtime tenants paying lower rents than what those apartments would fetch on the market now, since there’s no rent control on vacant apartments. As the strike moves into its second month, Daley said he’s heartened by the support they’re getting both within and outside the community, from teachers concerned about the impact on their students to the mayor, who weighed in this week to say he’d like to see MetCap meet with their tenants, although he also said he was skeptical on a rent strike being the solution.